Mike McMullen. 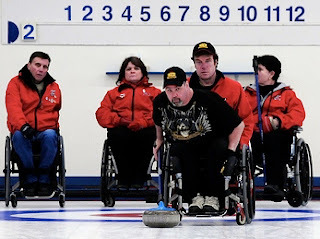 who will be playing 3rd for Cliff Nuspl's Host Team at the 2011 Nationals in Edmonton March 20-27, is profiled in the WestEdmontonLocal. Injured in fall 26 years ago, McMullen took up sports about ten years after his injury, first playing rugby and then curling. “It keeps you active, keeps you motivated, gets you out in the public,” McMullen said. There's one topic that he and Calgary's Jack Smart agree: the insistence that teams be of mixed gender is hindering the devlopment of the sport. "“It’s not holding the sport back in any way due to their skill levels, just there’s not a lot of them out there,” he maintains. Cathy Craig, the Host Team coach and manager of Jasper Place CC where the Nationals will take place, has agreed her team can live at home during the Championship. “What people don’t understand about wheelchair athletes when they travel is it’s hard work. It’s a challenge getting in and out of bed and going to the bathroom and getting out of the tub because most hotel rooms aren’t well equipped,” said Craig. I hear there is only two ACCESSIBLE rooms at Nationals this year. How can CCA expect a fair competition when half the players are "challenged " just to get themselves ready for competition. Is there any real understanding of what a person with disability has to go thru to get ready to compete. Let alone having to crawl in and out of bathroom when the need arrives. Only 2 Accessible rooms! I think in the interest of safety, athletes should be able to stay at other hotels with accessible rooms at the CCA's expense. This is not to be difficult, but so these people can be as independent as possible and safe. I don't think the CCA understands at all how difficult these trips are. Many of the competitors can stand and walk, but for those that can't they should have the same advantages regarding facilities. It should be safety first, especially when there are options (other hotels with accessible rooms).